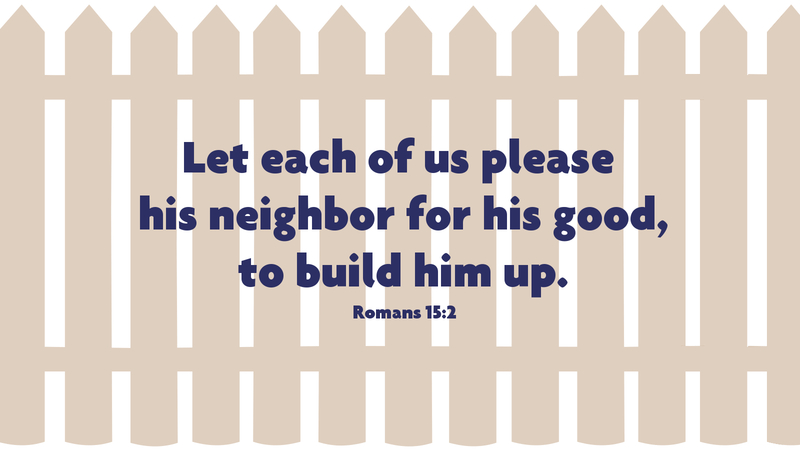 Paul states, “We who are strong ought to bear with the failings of the weak.” He continues about attending to our neighbor for his good—to build him up—as Christ did for us. In a spirit of unity, we are encouraged to accept one another as Christ accepted us in order to bring praise to God. That’s a tall order for many of us. Where and how do we start? In Luke 9, we get a glimpse of Jesus’ approach in the feeding of the five thousand. Jesus had them all sit in groups. Today we might equate that to our fellowship experiences in the church. What better way to get to know and relate to our neighbors than eating across from one another? How often do we kick off new relationships with a dining arrangement in our homes or in a nearby restaurant? It is a natural setting for coming to know each other and how we can be an edifying presence in the lives of others. Most of us, as Christians, can probably see how that dynamic has unfolded as others ministered and built us up in this faith. Who is the Holy Spirit encouraging you to feed today? Prayer: God of patience and love, lead us to be faithful as we feed and minister to those around us as we seek to bring praise to you in the name of Jesus Christ. Amen. Today’s devotion was written by The Rev. Robert V. Alle, NALC Pastor.